So many games this year are on boats, Gears of War 3 included. But the game isn't only on a boat, it's also on talk show Late Night with Jimmy Fallon. 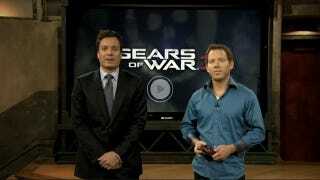 Gears designer Cliff Bleszinski and his shirt collar showed off the title and tried to shoot out an eyeball. Cliff couldn't. Neither could his shirt collar. Or his plaid cuffs, for that matter.